Tonight I was treated to dinner at The Cheesecake Factory. This is one of my favorite restaurants BUT it's book of a menu and family-sized portions do not make it easy to be "good." 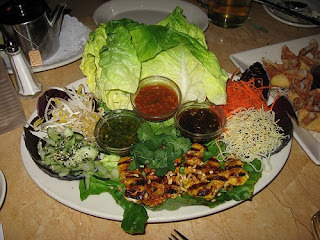 I had a little talk with myself and settled upon the Thai Lettuce Wraps. There was some last minute inner-dilemma about how amazing a pasta dish would be but I powered past that thought and stuck with what I assessed to be one of the most Paleo-friendly options. Requesting that the vermicelli noodles be omitted and ignoring the bean sprouts helped the cause as well. The sauces violate a few rules: one is peanut based and another definitely contains soy.